The women's championship started with six decisive games. | Photo: Lennart Ootes/Saint Louis Chess Club. Jeffery Xiong is the early leader at the 2019 U.S. championship thanks to a win with the black pieces vs Timur Gareyev. All six games in the women's championship were decisive. 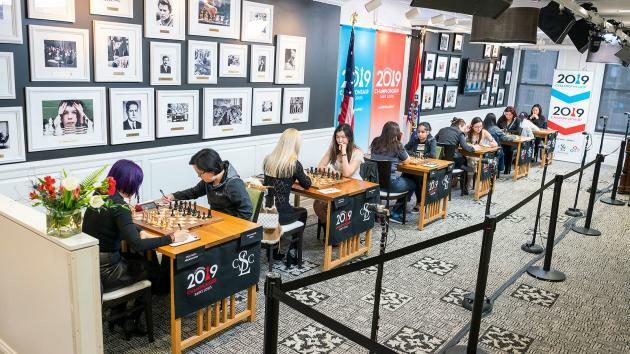 Moved up a bit in the calendar, the 2019 U.S. championships (open and women's) took off on Wednesday, for the 11th time in the Saint Louis Chess Club. At stake is a $50,000 first prize. At Monday's opening ceremony in the St. Louis Zoo, players chose a stuffed animal for their lot number. Caruana picked a penguin. | Photo: Lennart Ootes/Saint Louis Chess Club. A penguin was also Tatev Abrahamyan's choice, after which she visited some real ones! It's Sam Shankland who is defending his title this year, and it's going to be a very interesting year. Besides America's "holy trinity" (in the words of commentator Yasser Seirawan) Fabiano Caruana, Wesley So and Hikaru Nakamura, there are also Cuban GM Leinier Dominguez (now representing the U.S.) and rising stars such as Awonder Liang, Sam Sevian and Jeffery Xiong. With five 2700 players, it's the strongest U.S. championship ever—in fact, it starts to look like one of those USSR championships back in the day. Only a week ago, using the same boards and pieces, Xiong won the Spring Classic in St. Louis (where championship participants Var Akobian and Ray Robson also played). He is now the early leader, as the only winner in the first round. His opponent Timur Gareyev played creatively (as always), but also too passively. "Once I made some mistakes and played on the passive side, I think Jeffery really took over and played with a very good, smooth technique," said Gareyev, who also burned too much time on the clock early in the game. Jeffery Xiong is in excellent shape. | Photo: Lennart Ootes/Saint Louis Chess Club. An early 2700s clash was Hikaru Nakamura (who won the title last in 2015) vs Wesley So (the winner of 2017). Nakamura said he was happy with both playing White and a strong opponent. This way there's less pressure, which is good after having "a long break." The last classical event for these two players was Gibraltar. Hikaru Nakamura is going for his fifth title.| Photo: Lennart Ootes/Saint Louis Chess Club. "First and foremost I want to play well because last year was without a doubt a real disaster; there isn't any other way to put it," said Nakamura. The four-time U.S. champion also made some interesting comments on the difference between growing up as a chess player in his time, and nowadays. "When I was growing up a lot of my time was spent playing on the internet, which a lot of kids do now, but most of my chess culture was playing at the Marshall [Chess Club - PD], playing people like you [Maurice Ashley - PD] and other people in the city. The resources were a lot less," said Nakamura. "I've been quoted many times that I've never read a chess book cover to cover, which still more or less remains true," he said. "It's not about chess books. It's all about using computers, it's all about studying openings, endgames, whatever. Whether it's on the computer, whether it's online, it's all technology now. That, I think, was much different growing up because a lot of it was reading books or just simply playing, getting experience." "I was on Chess.com yesterday playing a couple of games," Nakamura continued. "I think I saw Fabiano and Wesley, I know I saw Sam on there as well, and I think even Jeffery. When you see all these players who are online, knowing that you're, say, a 2550-2600 GM, you can get online playing against players of this caliber, it's going to help you develop a lot quicker than in the past. Just the general resource everyone has now, you pick up things so much quicker. I think that's why you have kids getting really, really good at younger ages and I don't think that's gonna change at all, they're just going to keep getting younger and younger." Nakamura checking out the other games from the comfort of his chair. | Photo: Lennart Ootes/Saint Louis Chess Club. "I'm very happy to be back to classical chess!" said Leinier Dominguez, whose last classical event was the European Club Cub in Novi Sad in November 2016. Due to some legal procedures related to moving from Cuba to the U.S., he couldn't travel, and in that period he only played some rapid and blitz events in St. Louis. Dominguez started with a draw as Black against Var Akobian in the game between the two oldest participants, although both are only 35! Leinier Dominguez is making his debut at the U.S. championship. | Photo: Justin Kellar/Saint Louis Chess Club. Fabiano Caruana played three Bundesliga games at the start of this month, but before that his last classical event was the London Chess Classic. Perhaps inspired by his opponent Magnus Carlsen in the November title match, he now went for the Sveshnikov himself, against Sam Sevian. It was Caruana's turn to play the Sveshnikov.| Photo: Lennart Ootes/Saint Louis Chess Club. The longest game of the round saw Awonder Liang successfully defend a double rook endgame being two pawns down against Aleksandr Lenderman. The women's championship is incredibly young this year, with more than half the participants born in the 21st century. We'll also see the rivalry between Irina Krush and Anna Zatonskih again, but one player we'll be missing is Nazi Paikidze. The reigning champion decided not to defend her title. Participants at the opening ceremony of what's probably the youngest U.S. women's championship ever. | Photo: Lennart Ootes/Saint Louis Chess Club. "The kids are getting better!" was how "veteran" participant Anna Zatonskih put it. Before the tournament she had given the veterans the better chances to win the tournament, but after seeing the first-round results she said: "Maybe I will change my mind!" Zatonskih was especially impressed by Maggie Feng's win against Tatev Abrahamyan in a Winawer French. It was a long, theoretical line where Feng felt it was equal for long. Only in the time trouble phase Abrahamyan couldn't find the right plan, lost her h-pawn and then the game. "There's a greater chance for a young competitor to win this tournament because there's so many of us!" said Feng. Maggie Feng. | Photo: Lennart Ootes/Saint Louis Chess Club. Zatonskih herself started with a win vs Akshita Gorti. In a Benoni-type of pawn structure, White's majority in the center was decisive in the long run. Anna Zatonskih: "The kids are getting better!" | Photo: Lennart Ootes/Saint Louis Chess Club. Another veteran, Irina Krush, scored a win as well but here things were far from clear. When she lost her a3-pawn, the commentators were failing to find compensation for her. GM Robert Hess is providing commentary for all 11 rounds of the U.S. chess championship. However, after having played a good game, Emily Nguyen collapsed completely and Krush took all the tactical chances she was offered. Seven-time winner Irina Krush. | Photo: Lennart Ootes/Saint Louis Chess Club. The official broadcast of round one.